The Gentleman Crafter: Happy Friday! A nice little cold front came through this morning! But the rain they promised would come with...NOT! But I'll truly take the cooler weather. LOVE IT! This is just a crazy Friday Morning Post...But what can I say! I have some very exciting news coming this weekend and needed a new picture of my ugly mug for a headshot! So outside with my babies and a wooden pitchfork! Go figure....Give me a pitchfork and for some reason I go into japanese warlord mode. 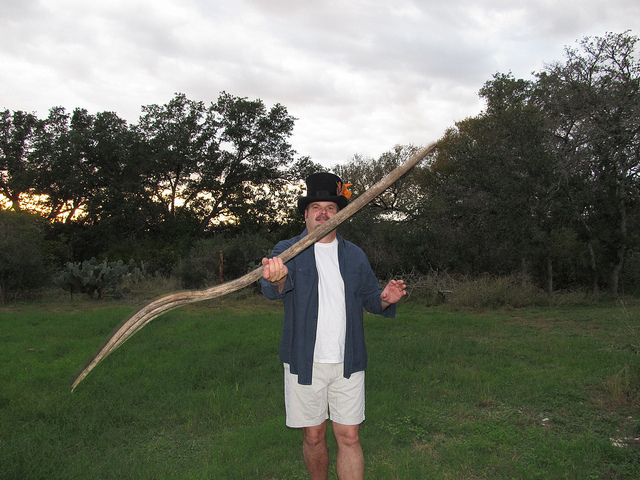 How a pitchfork can become nunchucks I don't know... but I sure tried! Y'all Have a wonderful-wonderful Friday! Craft Time Is Coming! Yahooo! LOL I can tell you were having fun! The last pic is fabulous! Your fur babies look so sweet... give then a good scratch behind the ear from me! You can't tease us like this... big news on the weekend?.... it's Friday. Close enough! Do I even want to know why you needed a picture with a pitchfork?????????? Thanks for the giggle and making me smile. You did look like you were having a grand time. Boys and their toys, lol. Now about that little bomb you dropped . . . some very exciting news? You are an outrageous tease! Looking forward to this news. I'm peein' my pants here just looking at you with the pitchfork. A cross between prison bars (with the dog thinking "I really don't know him") and the "American Gothic" painting. And a sweater with shorts? Weathered pitchfork needs to be downsized and incorporated into an embellishment on a canvas. would love to see those suckers for sale! I love the one with you looking thru it :-) Have a great Friday. On the last pic you looked a little bit threatening...kinda like a wooden pitch fork murderer!!! Love your doggies..used to have one like that named Ramsey. we are getting s little rain and it is cooling down here in Kerrville. i bet you are not in shorts today. LOL!!! Love the pics...looks like you were having fun with the pitchfork. Love the orange leaf adorning your top hat...very fallish. Thanks for the morning giggle!!! Toooooooo funny - LOL. Your babies do not look impressed at all. Can't wait for the exciting new!!! Fabulous. So enjoy how you embrace life with so much enthusiasm and smiles! Happy Friday to you. Looking forward to your new goodies. You are too funny. Love the one of you looking through the fork. Looks devilish. I want to come over and love on your "children". They look huggable and squeezable and long ears are my favorite! Your pet kids are great. Dogs and paper crafts are two of my top favorite things. Cool pitch fork. High YA!!! Digging the pitch fork...get it?!? It's cold here in Midland! I love the last pic the best! Handsome! Can't wait to hear more news....can there be any better than last weeks??? Cute as can be HatMan... problem is that fork is always covering some portion of your face (are you hiding?) and in the one where it isn't covering your face you look sooo serious (is dat choo?). And I agree, Friday is close enough..... give it up!! Love the Bassets!!! Hope the news is coming soon. I need some good news around here. No car, no water...what else can happen!!! Jim...you are very "to the manor born" in these. Your "yard" is stunning. I live in the desert in AZ, so we don't have lush properties like yours. Thanks for the tease of news to come. Every picture but the last one you are covering that handsome face of yours! Looks like you had a lot of fun...the babies looked bored, though! Ha. Jim it looks like you had a wonderful morning. 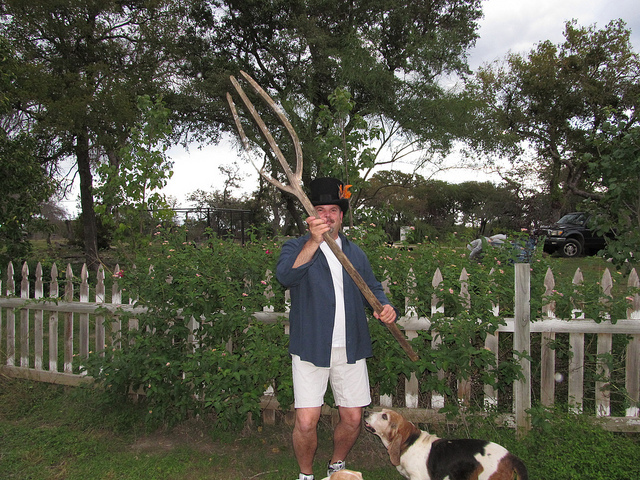 I am lovin the pitchfork, hmmmm trying to figure if it is for halloween or for thanksgiving. You are cute as ever! Found the rain you were expecting (or hoping for), it ended up here in KY :) I think that Pitchfork in certain pictures looks much like a royal sized dessert fork! I think those bassets would like a bit of that as well especially since they had to walk around watching out for their lives as you wielded that fork around like "nunchucks". How much more good/great news could you have for us???? I always knew you were Tim worthy, but now what??!? And I always thought Friday was part of the weekend! will be checking in hourly to see what you have on your platter now :D Have a great day, ours is filled with anxiety and impatience lol. Blessings! Thanks for the laughs. I have nothing else to say....I'm speechless! Love the pictures, and also the wonderful companions you have. Nice legs, Jim! (Wish mine looked that good!) The Bassets are a riot. 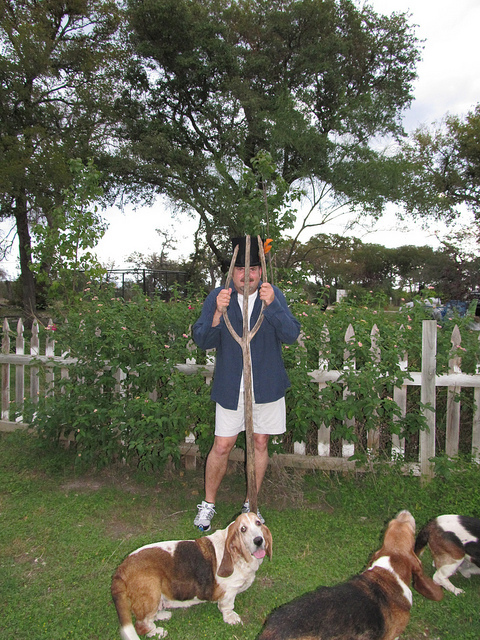 Let me know if you ever want a few more - my cousin is a one-woman Basset rescue. Those pics are great! But I think your babies are confused! 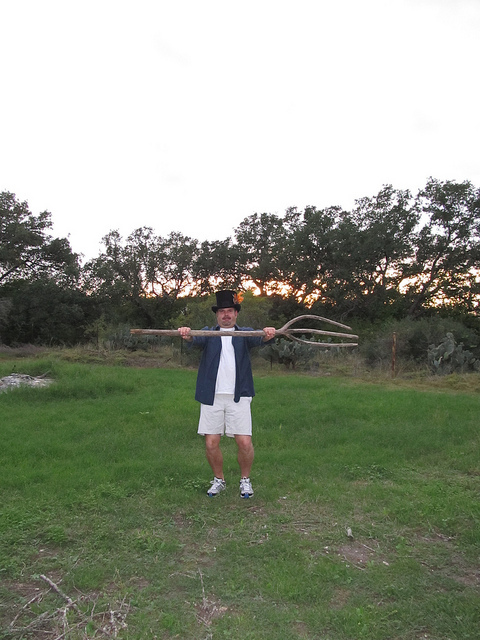 that's one heck of a pitchfork! If I was a snake, I'd steer clear. Great pics...I like the one of you with it over your shoulder the best. OMG You are too funny! The shorts make the outfit. I can't wait to see whats coming!!!! Jim, Jim, Jim, You make me laugh!! That pitchfork is huge mind you and a head shot with that in it has me going Hummmm... Your huge news has to be about Tim and your new journey??!! I can't wait to hear whats next for you and us too!! So BRING IT ON Master Jim and lets get this party started!!! Jim, you tickle my funny bone to the core!!!!! 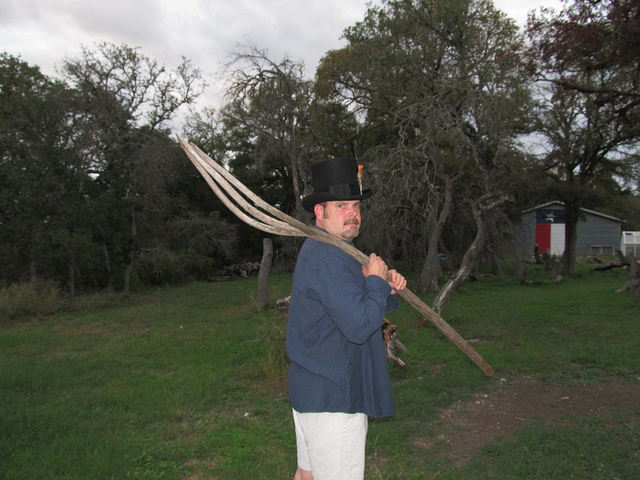 Love the pitch fork (and the shorts). You look more like a San Diegan then a Texan. They wear shorts and flip flops all year round here even in the dead of winter, so I am use to it. Looking forward to your show and tell project this weekend. I can't think why you'd need a photo with a pitchfork?! P.S. You can't possibly have any rain - we have got it all here in the UK.